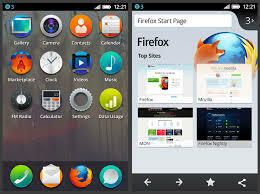 The main competition for Firefox OS is Nokia's Asha series, and Samsung's Java-based REX platform; both of which are also optimized for low end handsets. Furthermore, entry level Android handsets are also competing to the platform. Look like ARM-based mobile devices are powerful enough to support the Firefox OS. This section covers the basic hardware requirements as well as the recommended hardware features. For a good user experience, always choose a device that offers a uniform color profile implemented by the graphics device driver and headphone support for mute and unmute the sound and for stopping and playing media. These features are common among modern Smartphones. This is based on html5 and there are rumors that this will be open source os so we can run it on phones like the Nokia N9.Recently Mozilla has posted its official screenshots and let's see why people are saying that it looks like belle and android. Well this is really inspired a lot by Symbian bell and android but we can say that only for the I because we still don't know will it be as smooth as belle or will it be buggy or an heavy os as it is not yet released.